Performance Time: Approximately 90-120 minutes, 85 pgs. HOLIDAY. 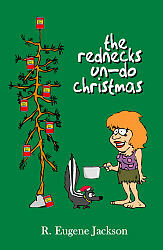 Celebrate the holidays with the Bubbas, a lovable redneck family, as they head even further south for another hilarious adventure! Fleeing West Virginny’s winter weather, the Bubbas have set up camp at a rundown trailer park in southern Alabama. But just as the Bubbas are getting ready to celebrate Christmas Eve with a pot of polecat gumbo, a family of snobby snowbirds arrive in their $10-million-dollar RV and try to force the Bubbas out of the trailer park. And to add to the madness, Bubba Santa Claus arrives on the scene frantically searching for Rudolph, who has mysteriously disappeared. To aid in the search, Bubba Santa hires the Blubber Team, the “best” covert paramilitary group in the South, to find Rudolph in time for Christmas. But when reindeer antlers and a reindeer leg turn up, it doesn’t look good for poor Rudolph, and Bubba Santa finds himself grounded on Christmas Eve, unable to deliver presents. However, with a little southern ingenuity, Bubba Santa finds a new way to deliver gifts—an RV with a global positioning system!